Dewalt recently announced the Universal Dust Extractor (DWH161) and SDS+ Dust Extraction Tube Kit (DWH200) at World of Concrete 2019. Each product offers portable and convenient OSHA Table 1-compliant solutions for dust collection. 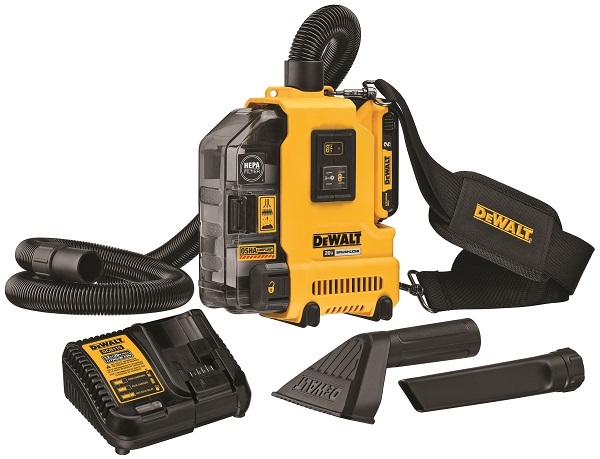 These Dewalt dust extractors come in onboard, stationary and portable with cordless and corded varieties available. The Universal Dust Extractor (DWH161) is an OSHA Table 1-compliant cordless, lightweight, and highly portable solution optimized for a wide range of tools and applications including SDS+ Rotary Hammers for drilling and chipping, percussion hammer drills, drywall cutout tools, sanders, routers, and jig saws. This compact tool offers mobile dust extraction for a wide variety of applications and jobsites and is lightweight at only 4.39 lbs, with the included 2.0Ah battery. In addition to its compact size, the Universal Dust Extractor also features multiple strap positions for enhanced ergonomics and an extra-large dust containment box which facilitates productivity by limiting the need to empty the box frequently. By also incorporating wireless tool control, a newly announced feature found on other Dewalt Dust Extractors such as the DCV585, the user can pair the extractor with a tool or fob for remote activation. Finally, powered by a 20V MAX* brushless motor, the Universal Dust Extractor is the ultimate in versatile dust extraction, capable of long runtime in demanding applications. The SDS+ Dust Extraction Tube Kit comes equipped with three interchangeable tubes for use with 10-in. and 6-in. SDS+ Drill Bits and Chisels plus a tube optimized for a wide range of stop bits, including standard and mini. In addition, the SDS+ Dust Extraction Tube Kit features a 3-ft long antistatic hose with an AIRLOCK connection and a side handle that includes an integrated depth stop and allows dust collection to be removed when not in use. Various adapter rings are included, allowing users to adapt to not only SDS+ Rotary Hammers but also Corded and Cordless Drill/Drivers and Hammer Drills. Dewalt offers 120 OSHA Table 1 Compliant** Solutions for drilling, cutting and grinding tools, dust extractors, accessories and shrouds intended to limit workers’ exposure to respirable crystalline silica. The line also includes the recently launched FLEXVOLT 60V MAX* Dust Extractor (DCV585). Each is part of the line of Dewalt PERFORM & PROTECT tools designed to provide a high level of protection in one or more of the following: control, dust containment or low vibration, without sacrificing performance. For a list of the Dewalt PERFORM & PROTECT drilling and grinding solutions that adhere to the new OSHA ruling on protections for workers exposed to respirable silica dust, go here. The Universal Dust Extractor (DWH161) will be available in summer 2019 for $249 MSRP and the SDS+ Dust Extraction Tube Kit (DWH200D) for $69.99 MSRP is available now. They each will come with a three-year limited warranty, one-year free service contract and 90-day money-back guarantee.